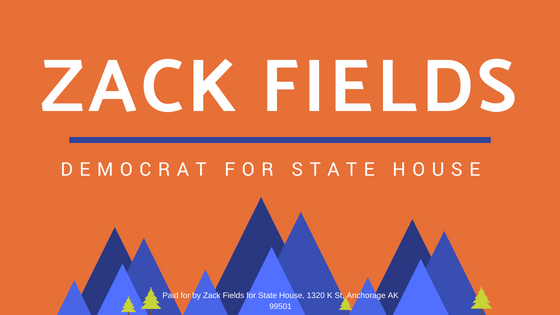 Zack Fields is a progressive Democrat running in House District 20, which includes Downtown, Fairview, South Addition, Government Hill, and Eastridge. November 6th is rapidly approaching. On election day, polls will be open 7am-8pm. In addition, you can vote early in-person at Anchorage City Hall, or the Division of Elections office at 2525 Gambell Street. Please note that you can cast a ballot at the Division of Elections office regardless of where you are registered in Alaska. Moved to Anchorage from Southeast? Please, still vote. Moved within Anchorage? Your vote should still count. When in doubt, go into the Division of Elections office and the elections staff will help you find the right ballot. I hope you can vote for me, but the most important thing is to be able to vote, period. Paid for by Zack Fields for State House, 1320 K St Anchorage AK 99501. Picture Window theme. Powered by Blogger.